MILLIGAN COLLEGE, TN (Sept. 27, 2013) — Milligan College will host its annual “Trunk or Treat” event on Monday, Oct. 28, from 6:30 to 8:30 p.m. The event is free and open to the public. This year’s Trunk or Treat will be held in the parking lot of Milligan’s Faculty Office Building, a new location for the festivities. The Faculty Office Building is located behind Milligan’s McMahan Student Center, and parking for the event is available behind the Gregory Center for the Liberal Arts. A safe and fun environment for children, “Trunk or Treat” will allow area youth an opportunity to enjoy this age old custom in a new and exciting way. 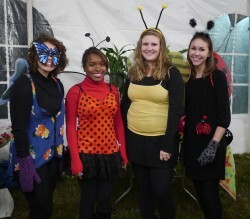 Milligan students will dress in costume and decorate their cars to house a variety of treats for participants. “Trunk or Treat” is sponsored by LINC (Linking Individuals to the Needs of the Community). The LINC volunteer center is a student-run organization that connects Milligan students to volunteer needs in the surrounding community. For more information, contact LINC at 423.461.8711. To learn more about Milligan, visit www.milligan.edu. Posted by tommy on September 27, 2013.